You can now use a DHT11 Temperature/Humidity sensor with ScratchGPIO. To get readings simple use an example script like this to ask for readings once per second from a sensor connected to pin10. Hi, I am new to this. I installed ScratchGPIO8 and tested it with blink11. It’s working fine. Next I connected up a DHT11 sensor (from Elegoo) and used your example script. I assume I have to set up two variables named humidity [temperature] sensor value, to show the outputs. Well I did that and connected up the module and ran the script. But I can’t get any values to show on those variables, other than 0! Could you see if I need to do anything else please? 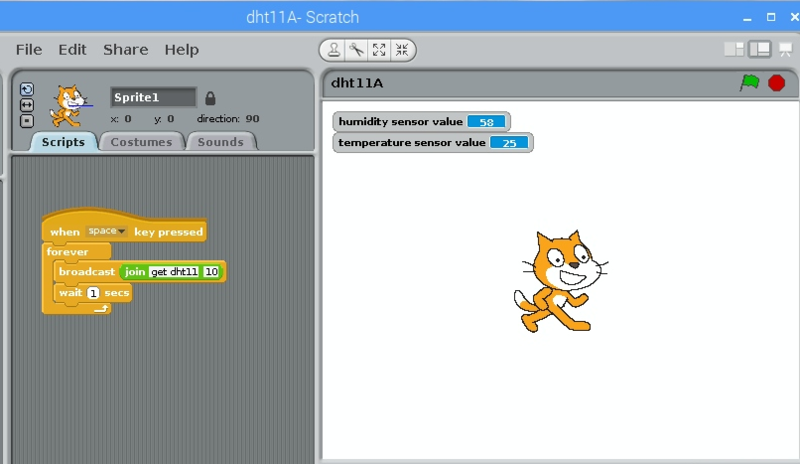 ScratchGPIO returns values using Scratch sensors. You should now be able to see the temperature and humidity sensor values.